A new Nintendo Direct hit this morning (yay I can finally watch it live for once). Coming in at a whopping 45 minutes long (longest Direct not including E3 specials) there are lots of goodies in store. New Fire Emblem game for 3DS. Choices you make in the game will affect the world. Puzzle and Dragons Z and Puzzle and Dragons Super Mario Brothers Edition announced a few days ago in Japan will be released May 2015. Another puzzle game Pokemon Shuffle(looks like Trozei) will be available in Feburary. Pokemon can Mega Evolve to clear the screen and has StreetPass function to get new items. Original Wii games will now be available from the eShop for digital download. Super Mario Galaxy 2 will be available now with Punchout and Metroid Prime Trilogy available soon. Kirby and the Rainbow Curse has amiibo support for Kirby characters amiibos giving you more powers. New Amiibo announced including Robin, Lucina, Pac Man, Wario, Ness, and Charizard. These will be out this March. Mario Party 10 will come with a new line of Super Mario themed amiibo including Mario, Luigi, Peach, Yoshi, Bowser, and Toad. Characters previously released from the Smash Bros amiibo line will function the same so you don't have to re-buy the new ones (just remember amiibo only store data for one game). More Splatoon details shown, including a main plaza in the game with shops you can purchase to customize your player and weapons. Will be available this May. 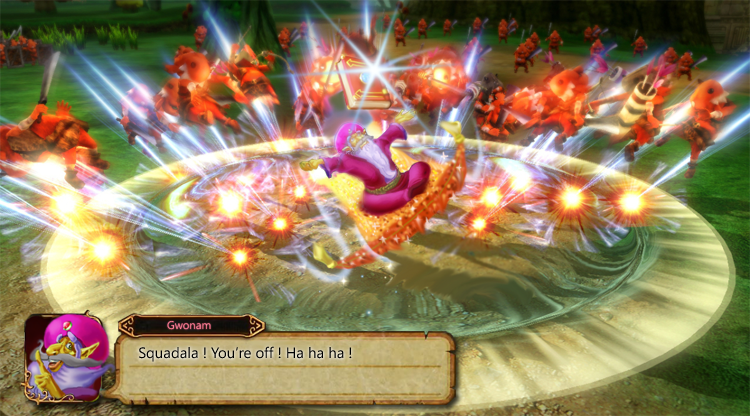 Tingle and Young Link will be available for Hyrule Warriors in celebration of Majora's Mask coming to the 3DS. A new trailer shown for Xenoblade Chronicals X.
Mario vs Donkey Kong Tipping Stars will be available on Wii U and 3DS, where if you buy one version of the game you will get the other version for free. A level creator is included and you can "tip" stars to creators of these levels online to unlock more parts. Many 3rd party games were shown, see Direct for full details. Fossil Fighters Frontier announced for 3DS. New Nintendo 3DS XL announced for the US on February 13th. No announcement of the regular-sized system (with the interchangeable faceplates). Will be available in Burgundy and Black and won't include a charger in the package (compatible with standard 3DS charger or purchased separately). Code Name STEAM will be compatible with Fire Emblem amiibos. They also said the Marth amiibo will have more being available for those of you who couldn't get it the first time around. Monster Hunter 4 will have a limited edition New 3DS XL system available. Legend of Zelda Majora's Mask 3D will have full 360 degree camera control if played on the New 3DS. Will be available on February 13 alongside a limited edition Majora's Mask New 3DS XL. Last edited by Yoshi648; January 14, 2015 at 07:19:51 AM. And here I was, thinking we'd only hear about two or three games today. - Wii games on Eshop: Don't suppose there'll be a way to clone Wii optical discs to the Wii U hard drive? Because I know a ton of people would love to have their Wii games digitally but probably don't want to have to buy them again. - Xenoblade Chronicles X: I have no words. There are no words. - Citizens of Earth: does this strike anybody like Earthbound, or is it just me? - New Nintendo 3DS: Okay, I kind of want to get one of these now. Also MM3D comes out on the same day. RIP savings. I already have a 3DS charger but the not including one thing feels kind of cheep. - 3DS face tracking: Er, guys, the reason I usually don't use 3D is because it murders the battery life but the thing where it tracks your face and adjusts the 3D is pretty cool. I swear, if they abuse microtransactions (read that if you haven't yet) with my favorite franchise, I won't be happy. Last edited by Cat333Pokémon; January 14, 2015 at 12:25:59 PM. Last edited by MattyBrollic; January 14, 2015 at 01:48:19 PM. Wow, that's a lot of great stuff announced for this Direct. Yay a new Fire Emblem game! Also someone on Tumblr posted this. Last edited by Magmaster12; January 14, 2015 at 03:49:44 PM.